These days, I've had a hard time putting down Peter Hessler's Oracle Bones, a book that explores the recent rapid changes of China's politics, economy, and culture. I just finished a chapter which investigates the Chinese government's lack of effort to preserve traditional architecture, especially that of the hutong, water alleyways bordered by courtyard homes. It got me to thinking about what measures, if any, the Korean government is taking to ensure the preservation of the hanok. Hanoks are one-story buildings designed in a cube, the shape of which depending on their geographical location in the country. While they are usually constructed using wooden beams and blocks of stone, other traditional building materials include straw, mulberry paper, and clay. They are truly beautiful and are undoubtedly a symbol of Korea. Though they can still be found all around the country, they are sometimes difficult to find in cities like Seoul, where re-development is rampant and the ill-effects of the Japanese attempt to wipe out Korean culture are evident. Back in the late 1970s, the Seoul government designated areas that had a particularly high concentration of these homes as cultural assets as to preserve them. The Gahoe-dong area in Jongro- also known as Bukchon Hanok Village- was one of the areas protected, as it contains over 500 hundred traditional hanoks, most of which belonged to yanban, or upper-class families. A traditional hanok nestled in the Bukchon Hanok Village in Jognro, Seoul. 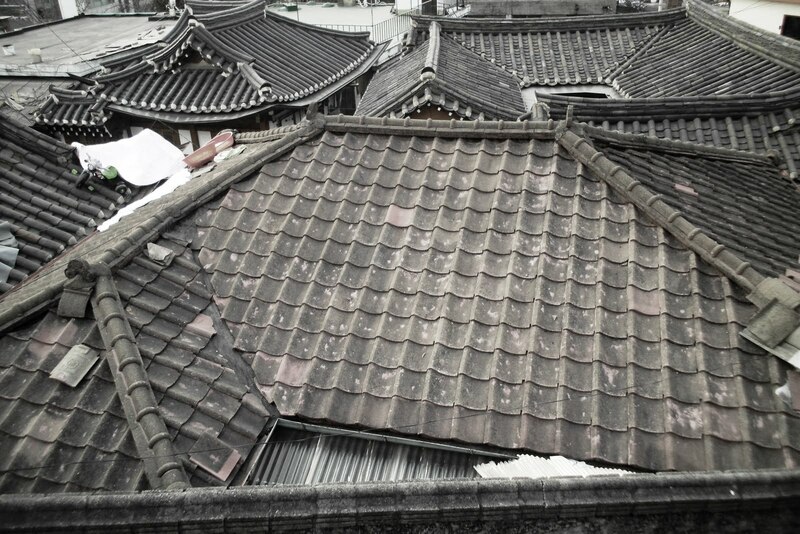 Just twenty years later, in 2000, only 2 streets in the Bukchon district remained as hanok-only areas. Again, the government issued grants and low-interest loans to both protect and conserve the areas as to refurbish the neighborhood to resemble its original self. Plans included the installation of better lighting, sprucing up the roads, and creating a tourist-friendly atmosphere by posting aesthetic maps and signs. Since then, unfortunately, many people have taken advantage of the said perks and government funding. In one case, a party used a loan to demolish a hanok and replace it with a modern two story building. This party was then issued a a general business license by government officials to use as he or she wished. It makes one wonder which side the Seoul administration is on, as they aren't actually enforcing their own policies. I'm sure corruption and politics are involved, as they usually are in this sort of situation, but I don't know enough to remark on that subject. Perhaps one of the most characteristic features of hanoks are their tiled roofs, which are particularly beautiful from one of the many elevated viewpoints of the Hanok Village. It's disheartening that the number of these beautiful homes are steadily declining. 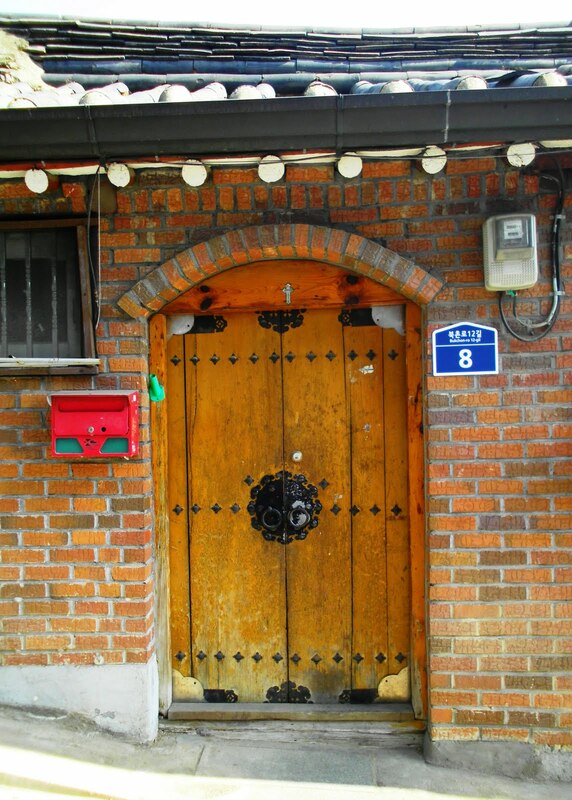 Yet, despite the situation, Bukchon Hanok Village is nothing less than charming. I spent my Saturday there, wandering around aimlessly. I found myself walking in circles but always finding a different path. Time seems to stand still in the small neighborhood and one can almost picture what Korean life was like a hundred years ago. The hanoks that are there have been beautifully restored from the carefully placed roof tiles to the majestic doors that mark the entrance to the homes. 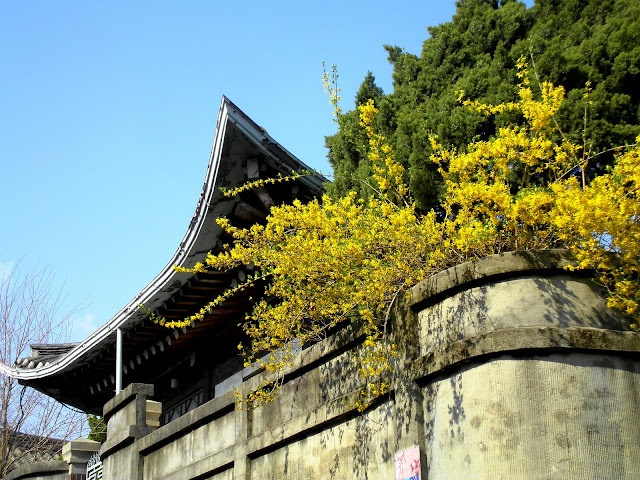 Many of the hanoks have been turned into museums that feature aspects of traditional Korean culture; there is a knot museum, a royal costume museum, and an embroidery museum, just to name a few. Others have been converted to upmarket restaurants and quaint tea houses. Occasionally, at a random turn of the road, a sightseer will be confronted with a look-out point over a very modern Seoul. It's only then that the current decade is obvious. Despite this home's brick facade, the gorgeous wooden and iron door is especially regal. I found myself trying to peek into the cracks and crevices of the walls that lined the streets. Here, spring flowers grow alongside the hanoks. It's easy to spend an entire afternoon strolling up and down the streets, which intertwine with those of Samcheongdong, an artsy neighborhood whose atmosphere combines both old-world Korea with contemporary charm. I've turned into a bit of an art enthusiast lately which makes this area particularly attracting. Visitors can browse through free galleries in between bouts of shopping for unique pieces in decorative boutiques. It also seems that most cafes in the area offer waffles of every variety and a trip to the neighborhood isn't complete without sampling one on a coffee shop patio. At least that's what the fashionistas and trend-setters who crowd the area seem to be doing. 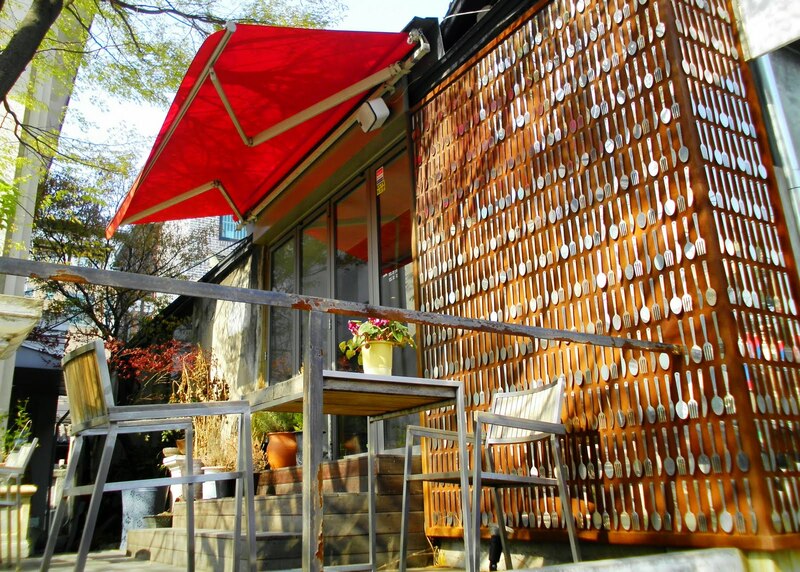 Cutlery hangs on the wall of this restaurant's patio in Gahoe-dong. While it doesn't necessarily give off the old-world vibe, it adds charm to the neighborhood. 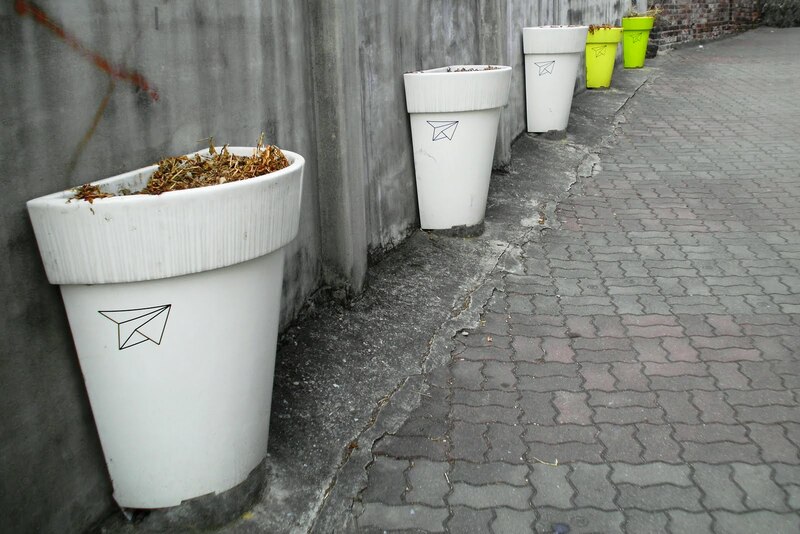 Everything about Samcheongdong oozes charm; the simplest of objects come across as artsy. The Bukchon Hanok Village is a delightful place that has something for everyone: delicious food, good shopping, and a lot of great places to snap couple photos. Yes, there is plenty of that to be seen, too. But, the best thing about the neighborhood is that it preserves the beauty of traditional Korean culture. While the debate over hanok conservation is heated among residents of these areas, as well as city officials, I hope that something can be done to preserve the district's ancient splendor. As I've said many times before, it can be hard to locate charm in Seoul. It would be a shame to see something as beautiful as the Korean hanok to become a thing of the past. 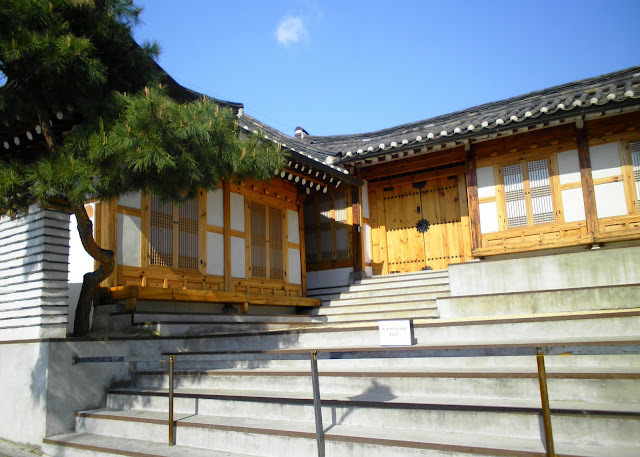 For more information about preservation efforts as well as news regarding hanok conservation, please visit this website: http://www.kahoidong.com/index_e.shtm .